IT’S UNLIKE ANY FRYER YOU’VE EVER SEEN. Introducing the all-new F5 — designed to deliver the most remarkable frying experience on the market. We do the right thing to help our partners deliver on their brand promise. Experience the difference. ENGINEERED TO LAST. AND LAST. AND LAST. We test 100% of our handcrafted units and stand behind everything we build. We partner with over 135 exclusive distributors in 100 countries and are battle-tested in the world's most demanding commercial kitchens. F5 The F5 takes low oil volume frying to the next level. Easier to use and maintain; same great savings story. FlexFusion Platinum Series Get the most out of your combi oven with intuitive touchpad controls and powerful new apps. FlexFusion Gold Series Get reliable performance and even moisture distribution — all with more capacity. 320 Series Get all-purpose open frying functionality from a true kitchen workhorse. 340 Series Larger capacity, meet a smaller footprint. SmartHold Don’t just add humidity. Control it precisely. Breading and Breading Systems We’re serving up exclusive offerings for every kitchen — and every palate. Countertop/Modular Holding Keep all your customers’ favorites within reach. EPC Reach-in convenience with 4 hours safe holding and green energy savings! Heated Holding Waste less and serve more. Looks like longer hold times are a win-win. HMR We're putting our best merchandising innovation on full display. OFE 291/OFG 391 High-volume open frying just got quite a lift. PFE 591/PFG 691 We think 24 lb of food per pressure frying load is pretty big news. Rotisseries When it comes to our rotisseries, chicken is just the first course. Velocity Series More throughput with less oil: a truly advanced pressure frying solution. 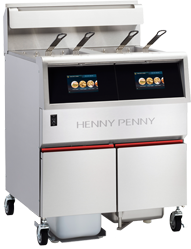 Henny Penny has unveiled the new F5 open fryer. As Henny Penny finished another strong year, the equipment manufacturer announced changes to its executive leadership team. The company’s continued growth has challenged leadership to accelerate the pace of scaling the business while executing day-to-day and staying focused on the long-term vision of being a People First organization that builds the world’s most premium commercial foodservice equipment. FROM WHISPERING OAKS TO WORLDWIDE GROWTH. Discover how a busy Sunday dinner crowd gave one man the inspiration for a history-making product — and sparked an industry-changing success story.